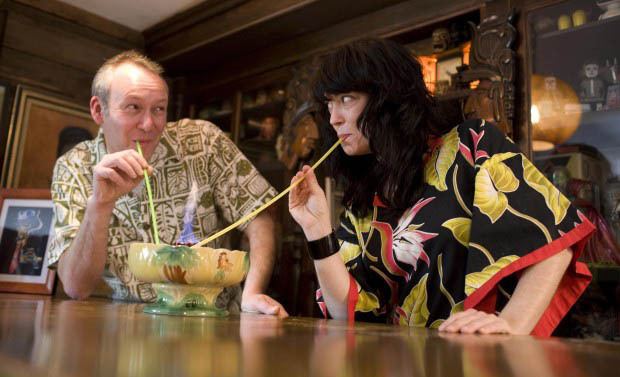 Mark Bloom and Maggie Rickard began their collaboration in 1994 in New York City when Mark’s love of tin robots collided with Maggie’s love of tiki. He was an illustrator from England and she was making body jewelry and playing the drums. Together they share a love for mid-century modern design, Frank Sinatra and finding Polynesian artifacts out in the wild. After moving to Tucson, Arizona in 2002 they realized that the North American wild tiki was becoming an endangered species and decided that they would have to create their own poly pop art to soothe their inner savages. Hence the birth of Velvet Glass, Mark and Maggie’s venture into the world of retro and tiki themed mosaics. Although they live in the Desert, the couple's work does not embrace the themes typically associated with the Southwest, rather it reflects their own personal styles and tastes. Their subjects have ranged from Godzilla to Mermaids, Spacemen to Samurai, Burlesque to Iggy Pop. And one Cowboy. 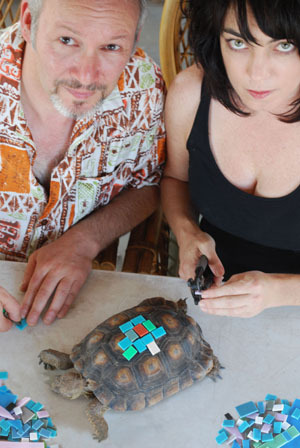 Mark & Maggie share their home with a dog named Alfie and a Desert Tortoise named Harold.